Featuring the USMTS Modifieds, USRA Holley Iron Man Stock Cars & B-Mods along with the WISSOTA Super Stocks and Street Stocks. 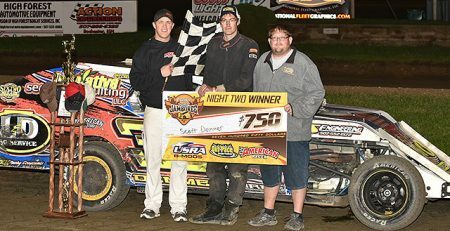 SPRING VALLEY, MN – May 22, 2015: For the 13th consecutive year Deer Creek Speedway will honor the brave men and women who defend this great country with the flag flying United States Modified Tour Series during the A&A Electric and Underground Southern Minnesota Spring Challenge. 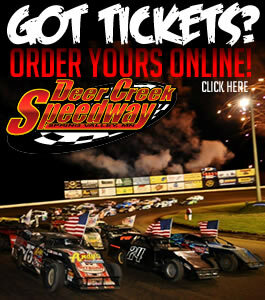 Also competing for the first time at The Creek in 2015 will be the fan favorite Holley Iron Man Stock Cars and the highly competitive Iron Man B-Mod series. The WISSOTA Super Stocks and Street Stock divisions will also be on hand for what’s forecasted to be a beautiful weekend. The weekend’s event will kick off at 3:00 p.m. on Button Buck Speedway as the Pee-Wee, Junior, and Senior KC Lawn Care Slingshot divisions will fight it out during night #3 of the championship point battle. Don’t forget that the afternoon events are FREE in the grandstands for ALL ages! The first green flag is set to fly at 6:00 on Deer Creek Speedway. Adult grandstand tickets are $18 and kids 12 and under are $5. Pit passes are $30.